Sussex all-rounder Michael Yardy has announced he will retire from all forms of cricket at the end of the season. The 34-year-old, who helped Sussex win the County Championship three times, played 28 one-day internationals and 14 Twenty20 internationals for England. Yardy was part of the side which won the World Twenty20 title in 2010, but returned home early from the 2011 World Cup with depression. "Now is the time to start a new journey away from playing cricket," he said. Yardy progressed through Sussex's youth system, made his first-class debut in 2000 and helped the club to Championship triumphs in 2003, 2006 and 2007. The left-arm spinner had a successful three-year stint as captain at Hove between 2009 and 2012, leading the side to the Twenty20 Cup and the Pro40 title in 2009 and promotion from County Championship Division Two in 2010. Having made his England debut in 2006, his international career came to an end following his withdrawal from the World Cup squad in 2011. After spending time away from the game, he had a second break from cricket in the summer of 2011 to aid his recovery. 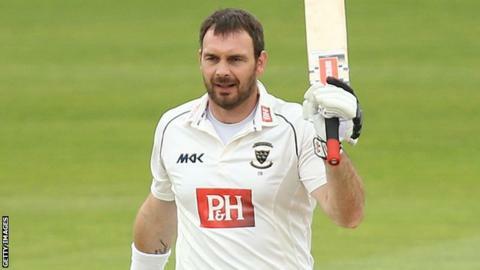 He has scored almost 10,000 first-class runs for Sussex in 182 appearances, and has played 166 List A and 101 T20 matches for the county. "I have found the last few years increasingly more difficult and frustrating, and want to look back on my career with pride and fondness," added Yardy. "I would like to thank so many people, including all the great team-mates over my career who have helped me be part of some very special things with Sussex and realise a dream of playing for England." Sussex cricket manager Mark Robinson described Yardy as "an integral part of the club". "He is a fantastic role model for everyone who has played alongside him and leads by example," Robinson told BBC Sussex. "We congratulate him on what has been an outstanding career and have some sadness that a lot of good times we have shared with him will be gone. "You hope that the influence he has had in the dressing room will live on."